Shifting Borders: Where Does Europe End? The perimeter of the Schengen area has been redrawn eight times. “Europe” is a fuzzy term. Unlike “Australia” or “Canada,” the area it denotes has no obvious limits (EU, single market, continent), so its definition remains unfixed. This uncertainty is a problem and an advantage, for it creates a dynamic; the policies of Europe’s nations determine the geography of the whole. A particular policy implies particular limits: Who should be in the eurozone? What will happen after Brexit? Where should migration be controlled? A particular limit such as continuous expansion or differentiation implies a particular configuration: a union of states and peoples, or a federation of nation states. Translated by Charles Goulden. This essay is published through an exclusive collaboration between The Nation and Le Monde Diplomatique. To subscribe to LMD, go to mondediplo.com/subscribe. Geographically, Europe is defined by the Ural Mountains and river to the east, the Aras River to the southeast, and the Strait of Gibraltar and the Bosphorus to the south. These limits, established in popular consciousness, come from decisions taken in specific historical circumstances. Without Mustafa Kemal Atatürk’s resistance in Thrace, the Bosphorus would also be a geopolitical limit. If Sebastian I of Portugal had won the Battle of the Three Kings in 1578, Europe’s southern border would not be the Strait of Gibraltar but somewhere between the southern Rif and Rabat. In Transcaucasia, under Persian and Turkish influence for centuries, the Aras River only became a southern border, replacing the Caucasus Mountains and later the Kura Valley, after Russian interventions south of the Caucasus against a weakened Persian empire. The river was a political border between Russia and Persia, which Georgian and Armenian geographers presented as the limits of Europe. Historically, Europe can be defined as a millenary civilization built on Roman law and Christianity. Philosopher Marc Crépon says it is founded on a double network of relations: those “that European nations have maintained with other nations (trade, imports, translations) but also those that ‘Europeans’ have built with the things they have dreamed, imagined or made up as Other.” An absence of clear natural limits led Europe to define itself in terms of differences from its neighbors—the warlike Muslims of the Arab-Berber kingdoms, the Byzantine and Ottoman empires. The fall of Constantinople in 1453 was traumatic: Pope Pius II was the first to tell the quarrelsome Christian princes that they must think like Europeans (europeicos) if they aimed to drive back the Turks. The name “Europe” entered the diplomatic vocabulary only after the Reformation, replacing a Christendom made fragile by its divisions. 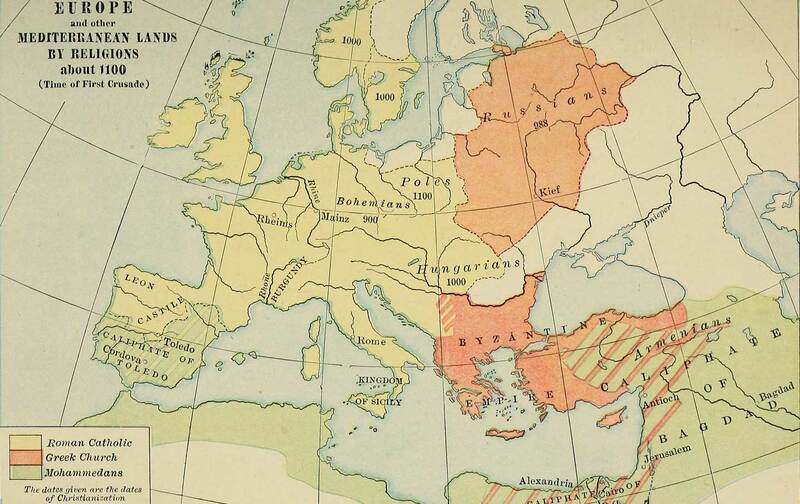 It became a political ideal after 1918, when a European consciousness with two distinct aspects emerged: “Europeanism,” the sense of belonging to a centuries-old civilization, and “Europeism,” the perception of an urgent need to “build Europe” to end war and banish, as early as the 1930s, fears of decline—a desperate remedy for its members. After 1945, the first European communities were established in the western part of a divided continent: the European Coal and Steel Community in 1951, then the European Economic Community in 1957. After 1991 and the end of the Soviet Union, geopolitics encouraged the eastward expansion of institutional Europe. What seems new is the establishment of a community based on rule of law, breaking with a past founded on equilibrium between rival countries on a continent that had always been a battlefield. This creation of a new Concert of Europe, founded on treaties and institutions rather than balances of power, is different from what came before. But today, the strength of a union that was established to affirm the primary importance of peace and compromise is also its weakness in a world of existential threats and naked international power. Each country has its own reasons for being or wanting to become an EU member. It is hard for Europe to see itself as a coherent entity and devise a joint foreign policy when expansion (which to the countries of central Europe seems a natural consequence of the expansion of NATO) is shifting the limits, and Europe’s nearest neighbors are being invited in. How can Europe be sure that the external borders of the Schengen area are under control when they have been moved eight times? Being a European state became a criterion for joining the EU, as set out in article 237 of the Treaty of Rome (1957) then the Maastricht Treaty (1992). After 1991, when expansion was not a matter for discussion, the European Commission said: “It combines geographical, historical and cultural elements which all contribute to the European identity. The shared experience of proximity, ideas, values and historical interaction cannot be condensed into a simple formula, and is subject to review by each succeeding generation. The Commission believes that it is neither possible nor opportune to establish now the frontiers of the European Union, whose contours will be shaped over many years to come.” The project would be defined by its members, its spatial dimensions determined by the sum total of the participating states. This approach was confirmed in 2010 by the Reflection Group on the Future of the EU 2030, which devoted only one paragraph out of 46 to limits. This remained the line until serious crises arose: conflict in Ukraine, challenges to the Schengen area, and terrorist threats. The failure to discuss limits is explained by the divisions they cause: Europeans don’t like to be seen disagreeing in public. Supporters of Turkey’s accession, knowing that the subject of borders was controversial, ensured the reflection group’s mandate did not mention them. The refusal to discuss limits, and set them, was intended to make the European community coincide with the Council of Europe, made up of the 47 signatories of the European Convention on Human Rights, which include Turkey (since 1950) and Russia (since 1996) but not Belarus. The continual shifting of borders perpetuates the vagueness of the concept of geographical Europe. The number of EU member states went from six in 1951 to 28 in 2016, and will fall to 27 with the departure of the United Kingdom. Candidate members (Albania, Macedonia, Montenegro, Serbia, Turkey) and would-be candidates (Bosnia and Herzegovina, Georgia, Kosovo, Moldova, Ukraine) are growing impatient. How can they feel part of a political community if its territory is not fixed? The images on euro notes include no symbols of shared ideals. Antagonistic concepts contribute to the difficulty in agreeing on Europe’s limits. Those who favor a federal Europe see expansion as an obstacle to integration; those against federalism see unlimited expansion as a safeguard—Germany’s Christian Democratic Union against Britain’s eurosceptics. France’s middle-ground position has been to expand southwards to balance Germany’s influence in the east, bringing in Greece under Valéry Giscard d’Estaing (1974–81), and Cyprus and Malta (and the start of negotiations with Turkey) under Jacques Chirac (1995–2007). There were originally two visions of the European project in France. For Jean Monnet (1888–1979), the infant community was a market that would one day be a source of political power; it was therefore open to the whole continent. For Robert Schuman (1886–1963), a Christian Democrat marked by Germany’s annexation of Alsace-Moselle, it should only bring together countries that resembled each other, in an extended Carolingian Europe. This vision was reiterated by the German Christian Democrats Wolfgang Schäuble and Karl Lamers in 1994, using the term Kerneuropa (Core Europe), and by the six founding nations (Belgium, France, Germany, Italy, Luxembourg, and the Netherlands) at an informal summit on June 25, 2016. Monnet’s Anglo-American vision prevailed, at least until the Brexit referendum. It had an economic objective—to form a single market where all were subject to the same rules on competition—and an infinite horizon. As the geopolitical situation changed, so did the motives for territorial expansion. Security was thought to be better guaranteed if neighboring states belonged to the same club: Germany’s national interests required that Poland should be a member and vice versa; in central Europe and the Baltic, the EU, together with NATO, has guaranteed recovered sovereignty. The desire to accede was also partly explained by political goals: To Portugal, the EU was synonymous with democracy and an end to colonial wars; to Spain, it symbolized the end of Francoism; to Greece, the end of the junta. The accession of Ireland and the UK helped to break their standoff and fostered more relaxed relations; European prospects forced the Balkan countries into dialogue. This expansion corresponds to the Anglo-American strategic vision of a European entity that would eventually coincide with the territory of the Council of Europe, though without Russia. Presidents George W. Bush and Barack Obama felt Turkey should join the EU. Vice President Biden supported the Ukrainian government, aiming to create a cordon sanitaire from the Baltic to the Black Sea. The United States has a clear vision of the ultimate limits. The member states have differing positions, linked to their national interests: Sweden backed the Baltic states; Poland backs Ukraine; Romania backs Moldova and Georgia; Greece backs Serbia. These positions are legitimate; together they contribute to continuous expansion. For states and political forces that insist on the geostrategic importance of a European project coupled with NATO, the EU would eventually include Turkey but not Russia. The only uncertainty is the southern Caucasus: Armenia, Azerbaijan, and Georgia. That is the vision of the countries of Central Europe and the Baltic, Northern and northwestern Europe. But for those who believe identity should be the basis of membership, and that this is founded on culture and values, Turkey, as a Muslim country, has no place. This is the position of the conservative, neoliberal European People’s Party, which is favorable to a system of concentric circles—EU, eurozone, smaller circle. The same goes for Schäuble and French politicians Joseph Daul, Nicolas Sarkozy, and Alain Juppé. The Party of European Socialists is more open to expansion as an opportunity to spread European values (secularism and the quest for Islamic democracy). The European Commission is pursuing a policy of continuous expansion, as favored by an administration that advocates depoliticized governance—single market, competition, and integration—with the implicit backing of a majority of states, operating as a federation. Others in France (such as President François Hollande), Germany, and Italy believe the EU’s capacity to absorb new members must be considered before any further expansion. They are in favor of a long pause, a strengthened European neighborhood policy that does not involve accession, and privileged partnerships. The idea of a more differentiated Europe is emerging, with an economic area of 32 countries (probably including the UK after 2019); the current EU, with 27 members (common market, structural policies, values); a eurozone, more integrated in fiscal and budgetary terms; a Schengen area, allowing internal mobility and controlling its external borders, even if that means defining a smaller security control area—a “Schengen plus”; and finally, a Europe of the founding members, centered on France, Germany, and Italy, plus a few others depending on their particular concerns: the Mediterranean and Africa for Spain, Poland in the context of the Weimar group. On June 25, 2016, the foreign ministers of the six founding members said they “recognize different levels of ambition amongst member states when it comes to the project of European integration.” This relates to the sovereign challenges—defense, sovereignty, and security—that all Europeans face but only a few states (France, Germany, Italy, Spain, the UK) can meet. The European project needs to be rethought, agreeing on what member states can contribute at the relevant level: the continent, its southern and eastern neighbors, the wider world. It is not a matter of excluding certain countries, but of being able to exercise an effective foreign policy that will promote common values and interests: strategic autonomy in security of trade flows (access to raw materials, security of trade routes) and critical networks and infrastructure; political and diplomatic management of imminent crises; strategic dialogue with the emerging world; a strategy of acting as a third-party facilitator within multilateral forums to avoid the formation of a US-Chinese duopoly; development aid (the EU is the world’s biggest donor). If the founding members of the European project—France, Germany, Italy, and Benelux—are not in a position to reformulate a common policy in the world of the future as they did during the cold war and decolonisation, if they don’t act as a center of gravity—with shared diagnosis, discussion, and explicit choices—then who will? Russia, China, the United States? Michel FoucherMichel Foucher is a geographer, a former ambassador, and chair of applied geopolitics at the Fondation Maison des Sciences de l’Homme’s College of Global Studies. His latest book is Le retour des frontiers (CNRS Editions).